Before beginning our round trip with its different stops, we have compiled some general information and figures on British Columbia: geography along with some figures, information on the climate, the vegetation and the animals as well as a short survey of British Columbia's population and their culture. The province of British Columbia (B.C.) ist situated in the South-West of Canada and is, with its area of 944.735 km², the country's 3rd largest province, corresponding to approx. two and a half times the size of the Federal Republic of Germany. B.C. 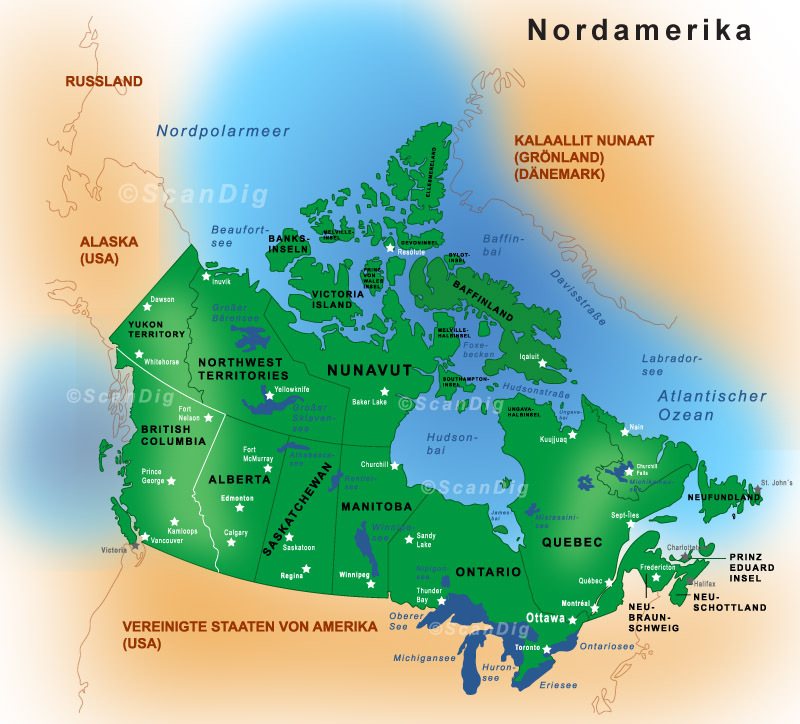 ist bordered by the Pacific in the West, the 60th northern parallel (Alaska, Yukon Territory and Northwet Territories) in the North, the Rocky Mountains and the province of Alberta in the East and in the South by the 49th northern parallel (US states of Washington, Idaho and Montana). Victoria, its capital, is situated in the far South-East of Canada on Vancouver Island and houses approx. 330,000 inhabitants. Only a few kilometres of Atlantic separate it from Vancouver, British Columbia's largest city with its 1.7 million inhabitants; With its area of about 31,000 square kilometres, Vancouver Island is the biggest island on the american West Coast. There are numerous fjords, and the coastline is rather cliffy, which makes British Columbia's coastline exceed 27,000 kilometres. Roughly speaking, the province's landscape can be divided into three: the Coast Mountains in the West, the Interior Plateau and the Eastern Rocky Mountains. More than 50% of its surface are situated at more than 1,300m above sea level, the highest mountains being Mount Fairweather (4,663 m) on the Alaskan border and Mount Waddington in the central massive of the Coast Mountains. Fraser River, originating at Mount Robson (3,954 m) in the Rocky Mountains, is the longest river with its 1,386 kilometres. 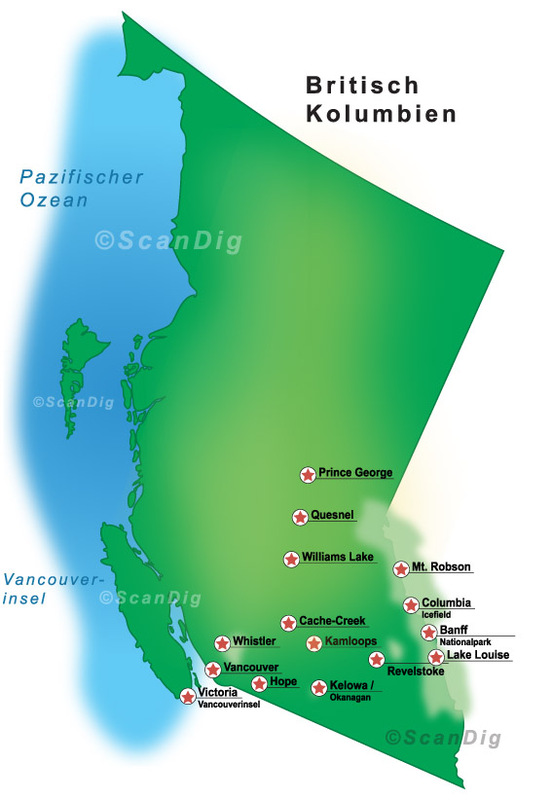 First it runs along the foothills of the mountains to the North-West, but then makes a bend to the South at Prince George to find its way through the Interior Plateau towards Vancouver, where its forms a delta between the continent and Vancouver Island and flows into the Pacific. British Columbia has numerous different climatic regions with the respective typical forms of vegetation; Along the shore of the Pacific Ocean west of the Coast Mountains and on Vancouver Island, the climate is humid and maritime; there are temperate rain forests, huge Douglas firs and abundant vegetation on the ground consisting of mosses, ferns and lichens. Off Vancouver's shore live whales (among them orcas), seals and sea lions; Vancouver Island itself is home of black bears, deer and marmots. In winter, temperatures seldom drop below 0 degrees centigrade here, which represents an important factor to the rain forest. Vancouver, for example, still enjoys the last warm days of summer when the North of British Columbia already is covered by a thick layer of snow. The climate east of the coastal mountains is mostly very dry as the heavy, rain-laden clouds arriving from the Pacific Ocean cannot cross the mountain range; Especially here, rainfall, sun intensity and the corresponding temperatures vary a lot, causing completely different weather conditions and vegetation within only a few kilometres. Sheltered by the mountains, the summers are hot, windless and dry; winters, however very cold due to arctic air streams, as there are no other mountains extending from East to West that could block off the cold air. The climate in the East of British Columbia is characterized by the Rocky Mountains. The weather in summer is mostly warm; the lowlands are very humid because of clouds raining off on the slopes and, in summer, adorned by a sea of flowers while a lot of snow falls in higher places. The climate and vegetation there are alpine. The high mountain ranges are mostly the home of Rocky Mountain goats, wapitis, black bears, grizzlies, moose and bighorns. The climate in the Interior Plateau varies a lot from North to South. In the North, there are rather few rainfalls, large deciduous and coniferous forests dominate the scenery; there is the pittoresque Indian Summer in early autumn before the sudden arrival of a very cold winter. Large populations of animals (black bears, grizzlies, wolves, wapitis, mooses, white head eagles etc.) live in the northern bush, that is also characterized by wide-stretching marshes that are crawling with mosquitoesin summer. In the mediterranean climate of the Okagan mountains further to the South, rain intensity is sometimes so high that intense fruit farming can be done and that thick forests grow. There are, however, as in the rest of the Interior Plateau as well, areas that are subject to desertification there which represent the typical flora (cactus) and fauna (rattlesnakes). Desert, rain forest and alpine climates are typical for British Columbia depending on height above sea level, orientation of the mountains and prevailing winds. With onl 4.2 million inhabitants - three quarters of which live in city regions -, British Columbia has only a very low densitiy of population. Due to the final colonization by the British in 1866, the majority of the population (70%) has white skin. Among these, 40% are of British, 25% of European and 5% of german descent. Further ethnic groups are formed by Chinese (10%), Asians in general (5%), Indians (5%) and American Indians (3%), the natives of America (First Nations); Nowadays, British Columbia is proud of its cultural diversity that mainly takes effect in the soth-west agglomeration around and in Vancouver, the government supporting cultural associations. The role of Indian tradition, however, has gained a lot of importance throughout the whole province. Neither the one nor the other can be taken for granted considering the historic background; Restrictions in migration in the beginning of the 20th century as well as the continued suppression of the Indians clearly represented the supremacy of the Whites. Today, the works of art of the natives, mainly carvings (e.g. totem poles) and paintings serve as signboards to renowned art exhibitions in Vancouver and in representative places in all British Columbia. Life is, however, not free of problems for the First Nations there. Although they are granted special rights in their reservations and are free to live their culture in all instances, many of them live in social houses they can pay off in monthly rates; however, joblessness is in most cases responsible for the fact that the Indians are not able to purchase the houses they live in. Therefore, they do not consider them to be their property and neglect them. Further more, the abuse of alcohol and drugs is a central problem within the tribal communities. It is not seldom that city sceneries in British Columbia are characterized by groups of drunken Indians, especially during the summer months.